QA International Certification Limited is an accredited certification body issuing internationally recognised accredited certificates to companies across a wide range of manufacturing and service industries confirming compliance with various national and international management standards. QAIC also issues non-accredited and own-brand certificates for schemes not subject to accreditation. The services provided by QA International Certification Ltd as an accredited certification body are designed to help customers maintain their systems to the latest standards and most up to date industry specifications and to demonstrate this to existing and potential new customers. An appropriately qualified, trained and experienced assessor, is matched to each customer by QAICL. Whilst an organisation must be subject to rigorous examination as part of the assessment and surveillance process, it is the duty of assessors to ensure that they also add value to the benefit of the customer. Full details on all services offered by QA International Certification are obtainable from both UK and overseas offices and further information can also be obtained by completing our enquiry form. Having an environmental management system complying with the requirements of the international standard ISO14001 will assist companies in identifying and managing environmental issues relating to their activities. QAICL, as a UKAS accredited body, can provide certification to this standard which is suitable for businesses across all sectors and industries. ISO14001 details the requirements for an internationally recognised and accepted environmental management system which can prove to your customers and other stakeholders that you comply with relevant statutory and regulatory requirements relating to environmental matters. QA International Certification Limited has formulated an ISO 45001 Migration plan to allow customers to gradually migrate from the 2007 version of OHSAS 18001. From April 2020 all audit plans prepared for existing and new customers shall include ISO 45001 as the audit criteria. As QA International Certification Limited issues annual registration certificates, such certificates will cease to be valid after the end of 31st March 2021. Certification to the various BRC Standards form a separate Sector Scheme amongst the many accredited scopes offered by QA International Certification. This sector is administered directly by QAIC (Packaging) Limited which services and manages the auditing of all companies seeking registration. For many years, packaging manufacturers and suppliers have commissioned hygiene audits, in order to satisfy the ‘due diligence’ defence found in United Kingdom legislation, and to improve their own premises and practices. Many retailers and food manufacturers also inspected packaging premises in order to satisfy themselves that systems and procedures at their packaging suppliers meet their individual requirements. Full details on all services offered by QAIC Packaging are obtainable from both UK and overseas offices and further information can also be obtained by completing our enquiry form. Falling outside of UKAS and CNAS acreditation, QAIC (Training) Ltd provides specialist customer support in the field of high quality training, which is an important element in the introduction, implementation and maintainance of accredited certification schemes. QAICL offers a range of standard courses and can also offer specific courses tailored to your requirements. Courses offered cover Quality and Environmental Management systems, Health & Safety, HACCP and First Aid at Work. QA International Certification Limited offers certification for various other standards. These include, amongst others, Medical Devices (ISO13485:2016); Building Information Modelling (BIM) and HACCP. QA International Certification Limited is an accredited* certification body issuing internationally recognised certificates to companies across a wide range of manufacturing and service industries confirming compliance with various national and international management and manufacturing standards. 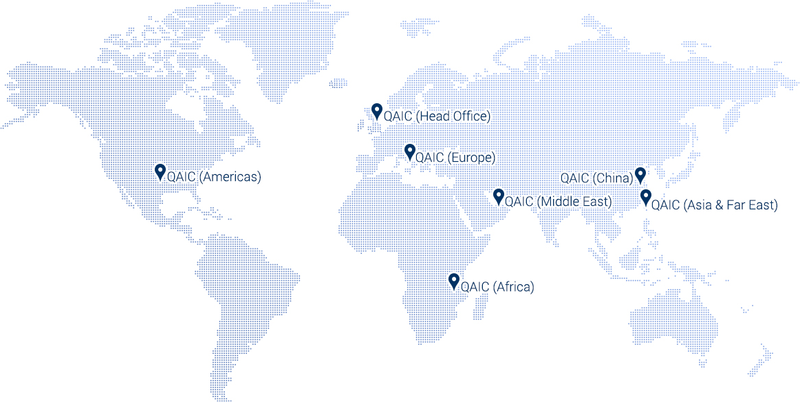 Based in the UK but operating from a number of regional offices across the world, QA International offers a cost effective support service throughout the whole registration process. Companies will want to choose a certification body they feel comfortable with because the partnership between client and certification body is a close one. QA International’s assessor selection and allocation process is both thorough and rigorous to ensure compatibility between assessor and client and to give the client confidence in the whole certification process. On completion of certification, QA International can record company certification details in the relevant Governmental and Industrial Directories (including the BIS Register in the UK). * Use of the term ‘accredited’ has a specific meaning in certification and relates to the provision of registration certificates bearing the an accreditation body mark. Such certificates are issued under conditions specified by the accreditation body, and any requirements or limitations are noted within QAICL’s ‘Accreditation Schedules’, which are posted on the UKAS and CNAS web-site (See links above). QA International also issues non-accredited certification for schemes not subject to UKAS or CNAS accreditation.